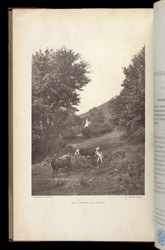 "The first prize silver medal has been awarded to Mr. J. Oswell Bury (Wrexham), for his photograph 'On a Welsh Hillside,' which is reproduced as a frontispiece in this number of the Reporter in Woodburygravure. The photograph was taken on a bright day in September about noon, in diffused light, with a Ross' R.R. lens, f/16, 1/2 sec. exposure being given to a Wratten 'Instantaneous' plate. The print is on Obernetter paper, and we have as nearly as possible secured the tone which was given to the original print by the sulphocyanide of ammonia bath. We also have obtained a matt surface which is also copying the original."